A total of 23 patients were treated at five dose escalations with high-dose combination cyclophosphamide, cisplatin, and melphalan with autologous bone marrow support. The maximum tolerated doses of cyclophosphamide, cisplatin, and melphalan were 5,625, 180, and 80 mg/m2, respectively. The dose-limiting toxicity was cardiac toxicity. Objective tumor regression occurred in 14 of 18 evaluable cases, with a median duration of 3.5 months. Pharmacokinetic evaluation of melphalan in 20 patients revealed a dose-related increase in maximum plasma concentration (Cmax) and area under the curve (AUC). Perturbation of the melphalan plasma half-life and AUC, associated with severe toxicity, resulted when renal insufficiency occurred. 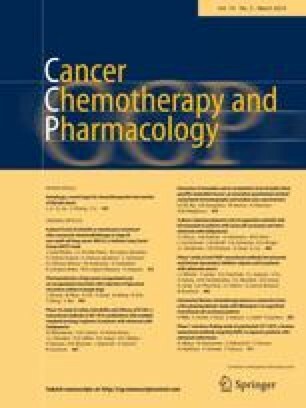 The results suggest that high-dose combination cyclophosphamide, cisplatin, and melphalan produces frequent, rapid responses in breast cancer, melanoma, and sarcoma, although with significant extramedullary toxicity. The pharmacokinetics suggest that modification of the treatment schedule may result in a reduction of treatment-related toxicity.